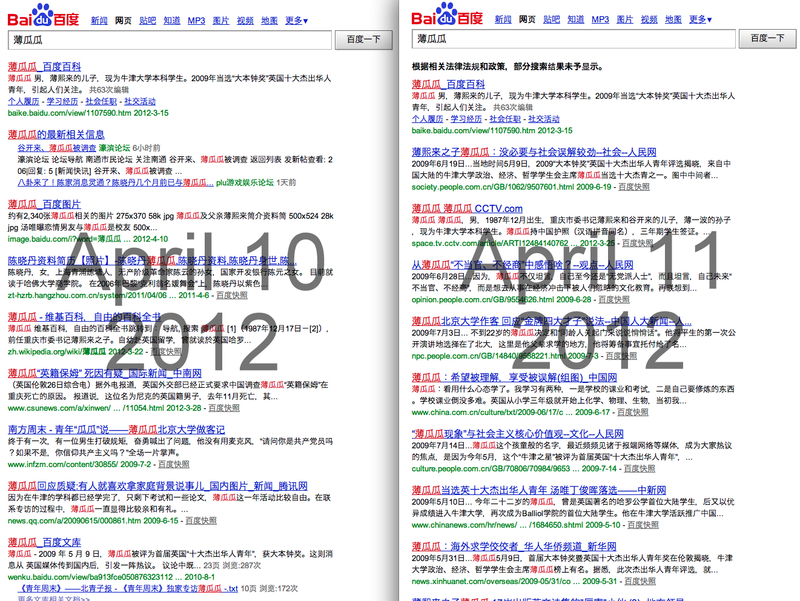 On October 31, 2012, China's official news agency Xinhua published a list of "major events in the country during the past five years since the CPC's 17th National Congress was convened" which had been compiled by the Party History Research Center of the CPC Central Committee. 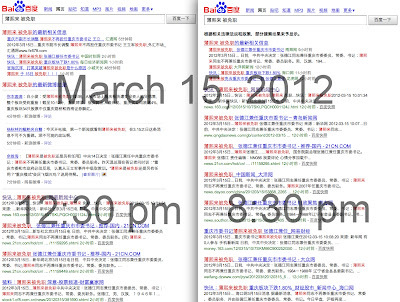 The following is a selection of some of the events listed by Xinhua, along with screenshots showing how information relating to those events was censored. Xinhua: October 22, Hu Jintao was elected as general secretary of the 17th CPC Central Committee and named chairman of the CPC Central Military Commission at the first plenum of the 17th CPC Central Committee. 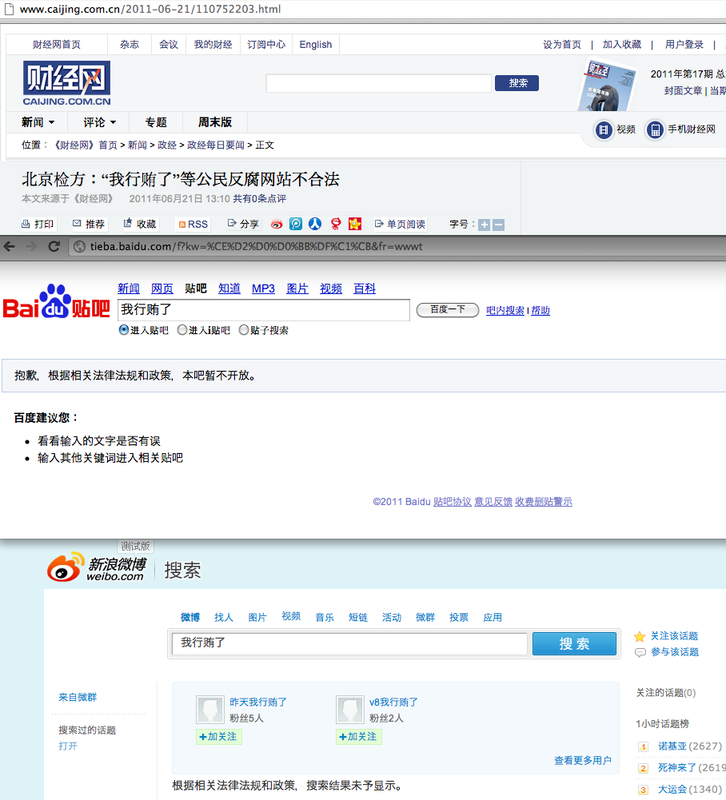 Baidu Tieba and Sina Weibo return no results, only censorship notices. 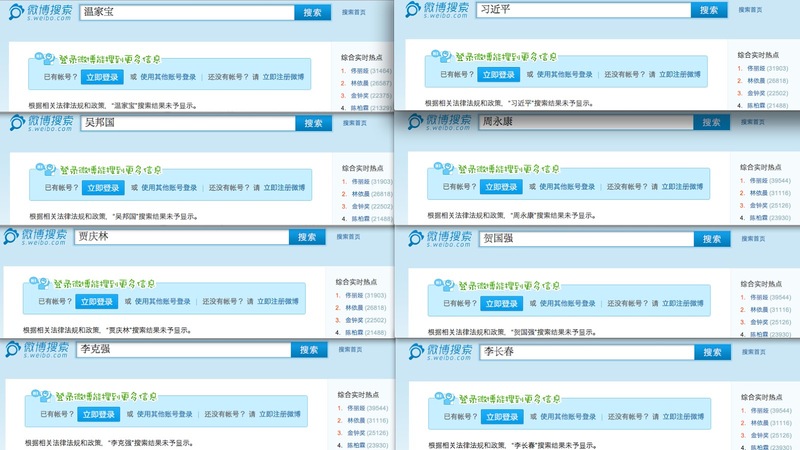 Xinhua: Members of the newly elected Standing Committee of the Political Bureau of the 17th CPC Central Committee were Hu Jintao, Wu Bangguo, Wen Jiabao, Jia Qinglin, Li Changchun, Xi Jinping, Li Keqiang, He Guoqiang and Zhou Yongkang. 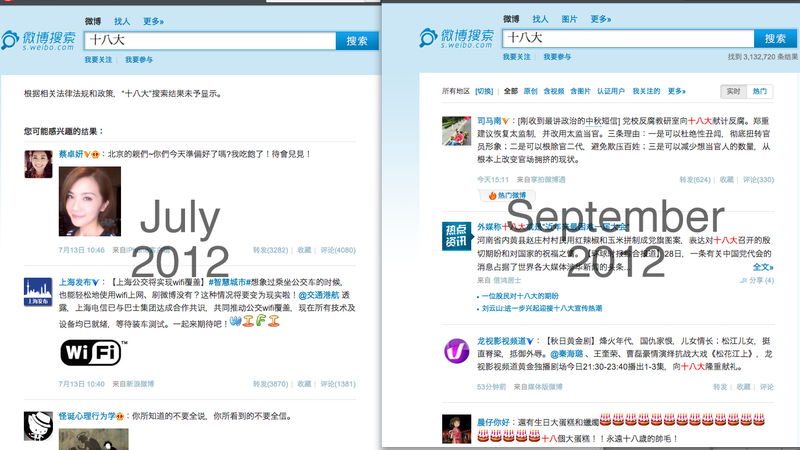 PBSC members on Sina Weibo return no results, only censorship notices. Xinhua: From mid November to December, the country's eight non-Communist parties and the All-China Federation of Industry and Commerce conducted their leadership reshuffle. Xinhua: The eight political parties were the Revolutionary Committee of the Chinese Kuomintang, China Democratic League, China National Democratic Construction Association, China Association for Promoting Democracy, Chinese Peasants and Workers Democratic Party, China Zhi Gong Dang, Jiu San Society and Taiwan Democratic Self-Government League. 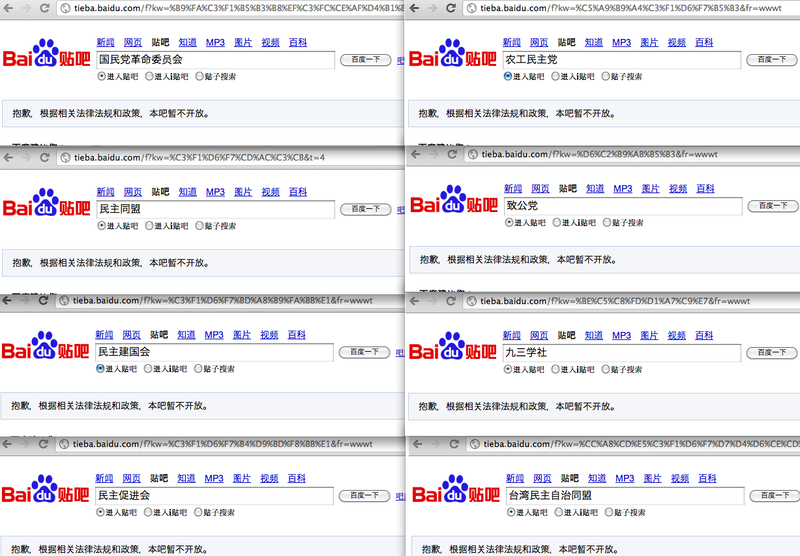 eight political parties on Baidu Tieba return no results, only censorship notices. 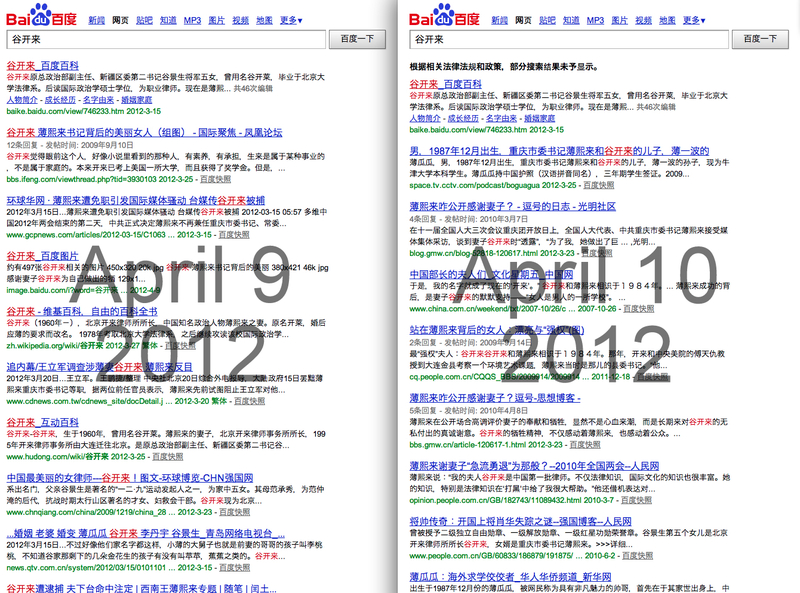 Xinhua: In mid-March, riotous activities of robbery, arson and vandalism occurred in Lhasa and other Tibetan regions. 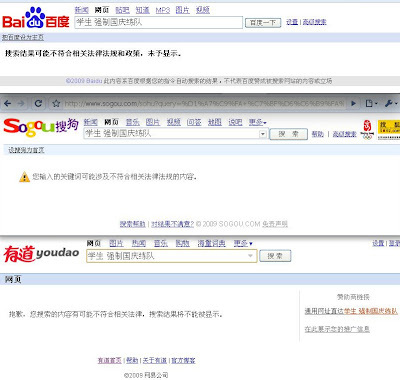 The Party and the government adopted resolute measures to control the situation and resume normal social order. 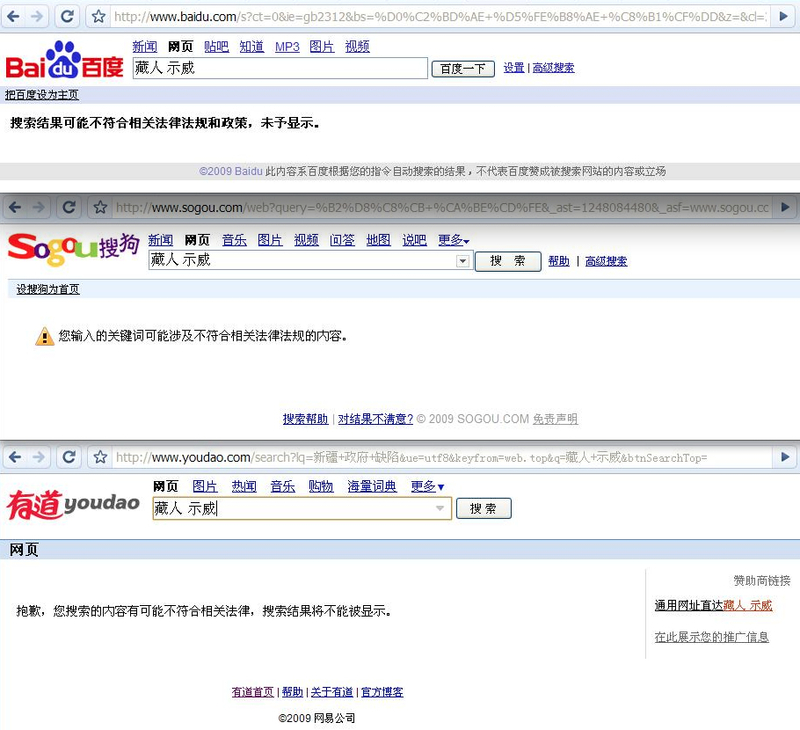 These screenshots, taken in 2009, show that searches for "Tibetans Demonstrate"
on Baidu, Sogou, and Youdao return no results, only censorship notices. Xinhua: May 12, a deadly 8-magnitude earthquake occurred in southwest China's Sichuan Province, leaving nearly 70,000 people dead and 18,000 missing. 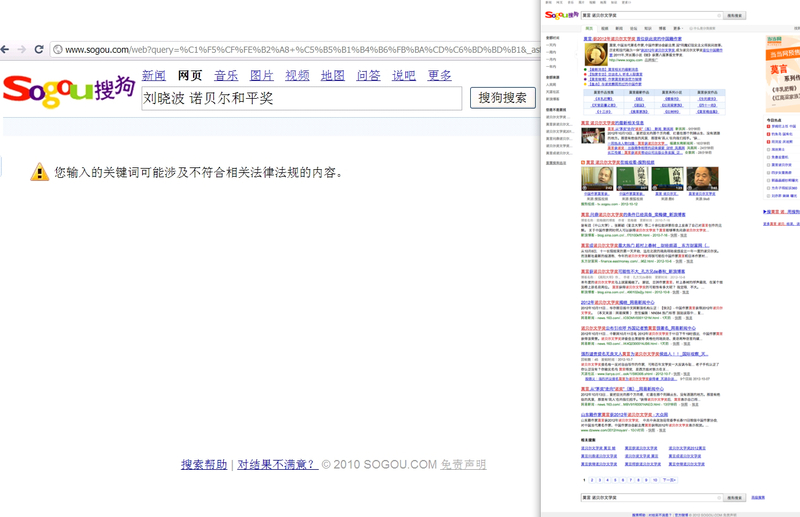 Yahoo.cn search for "Wenchuan Earthquake Tangshan Earthquake"
return no results, only censorship notices. Xinhua: August 8 to 24 and September 6 to 17, the Beijing Olympic and Paralympic Games were held, respectively, with China taking the top spot in the gold medal tally. 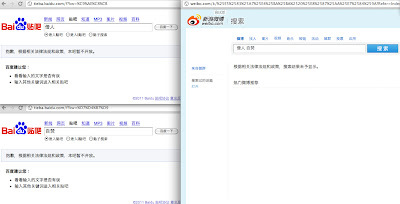 "Olympics Disturb the People" and "Opening Ceremony Fake Singing"
Xinhua: September 13, the State Council launched a first-level national emergency response to the Sanlu milk powder scandal, caused by the Sanlu Group, one of China's largest dairy makers, which produced infant formula adulterated with melamine. The Cabinet established a special committee on food safety on Feb. 6, 2010. Xinhua: July 5, severe violence broke out in Urumqi, Xinjiang Uygur Autonomous Region, in which rock-flinging and knife-wielding thugs looted shops, torched vehicles and killed nearly 200 people. The CPC Central Committee and the government took decisive measures, handled the incident in accordance with the law and maintained social stability. Xinhua: October 1, a grand celebration was held to mark the 60th anniversary of the founding of People's Republic of China. Xinhua: January 11 to 13, the fifth plenary session of the Communist Party of China 17th Central Commission for Discipline Inspection, the Party's anti-graft body, was held. President Hu Jintao addressed the meeting, urging greater efforts in the fight against corruption and the building of a clean government. 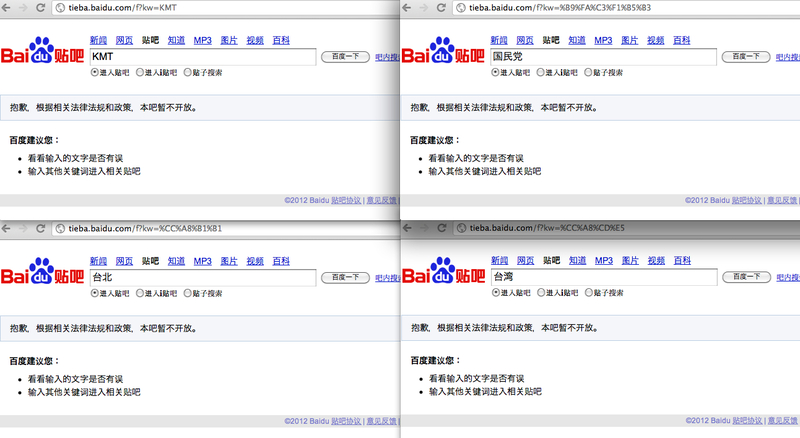 for that phrase return no results, only a censorship notice. Xinhua: August 27, Chinese Premier Wen Jiabao urged government officials at all levels to strictly follow the laws and regulations in a bid to steer away from corruption and ensure public good. article entitled "Leaders, what watch are you wearing?" Xinhua: July 1, China marked the 90th founding anniversary of the CPC with a grand gathering, at which President Hu, also general secretary of the CPC Central Committee, delivered a keynote speech. 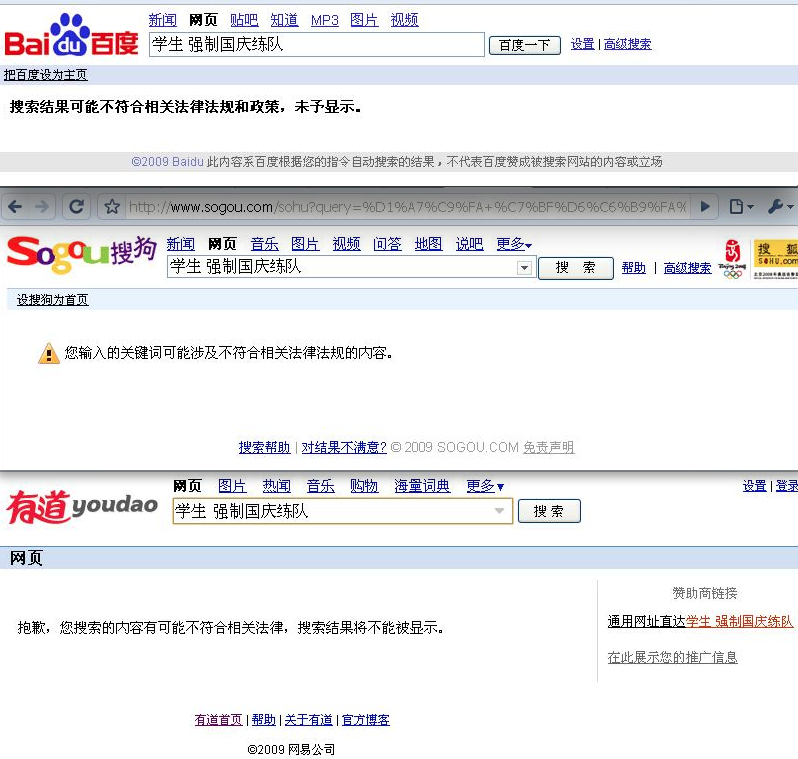 Cultural Revolution return no results, only a censorship notice. Xinhua: July 19, a rally was held in Lhasa celebrating the 60th anniversary of the peaceful liberation of Tibet. Vice President Xi made a speech at the rally. 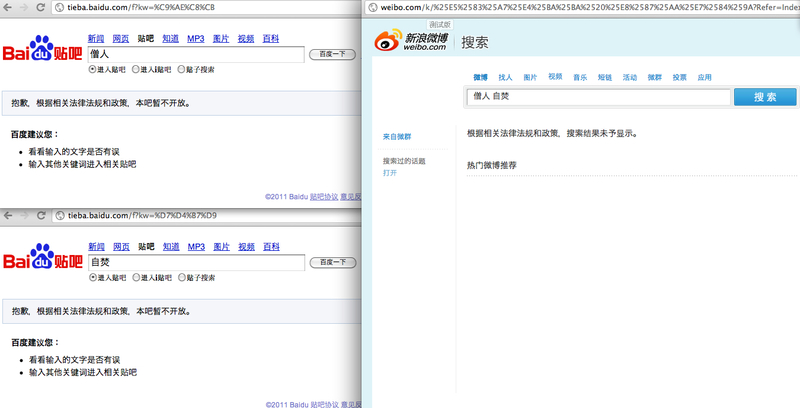 for "Monks" and "Self-Immolate" and on Sina Weibo for "Monks Self-Immolate"
return no results, only a censorship notice. Xinhua: October 9, China held a grand ceremony to commemorate the centennial anniversary of the 1911 Revolution, which ended 2,000 years of imperial rule. In his keynote speech, President Hu said the great rejuvenation of the Chinese nation must be achieved by adhering to socialism with Chinese characteristics, with patriotism and by upholding peace, development and cooperation. 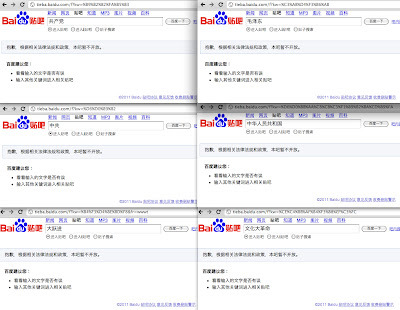 for KMT, Guo Min Dang, Taipei, and Taiwan return no results, only censorship notices. Xinhua: March 14, the CPC Central Committee announced that Zhang Dejiang had been appointed Party chief of Chongqing, replacing Bo Xilai. 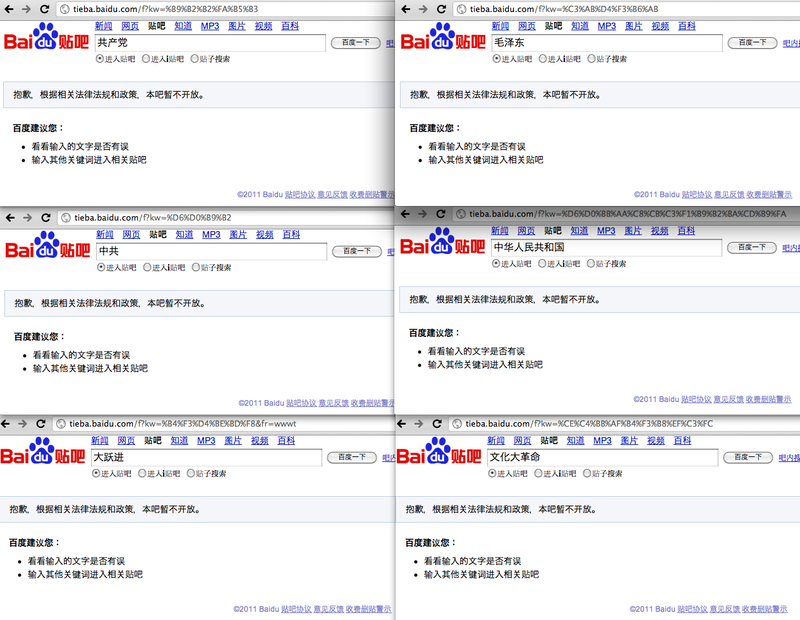 was already censoring searches for "Bo Xilai." 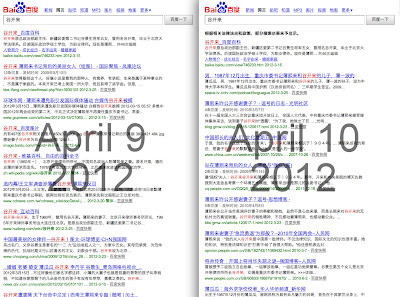 censoring searches for "Bo Xilai Fired." 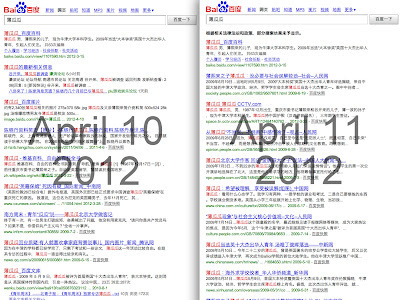 Xinhua: April 10, the CPC Central Committee said that it had decided to suspend Bo's membership in the CPC Central Committee Political Bureau and the CPC Central Committee; meanwhile, the Central Commission for Discipline Inspection of the CPC would start an investigation. 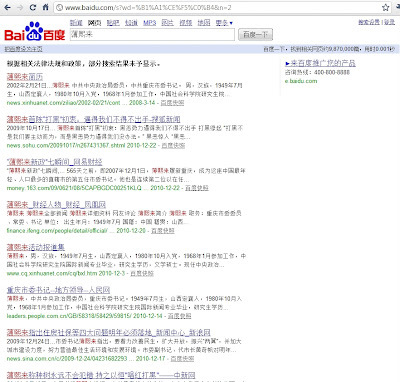 censoring searches for "Gu Kalai," Bo Xilai's wife. censoring searches for "Bo Guagua," Bo Xilai's son. Xinhua: July 1, President Hu addressed a gathering for the 15th anniversary of Hong Kong's return to China and the swearing-in ceremony of the fourth-term government of the Hong Kong Special Administrative Region. 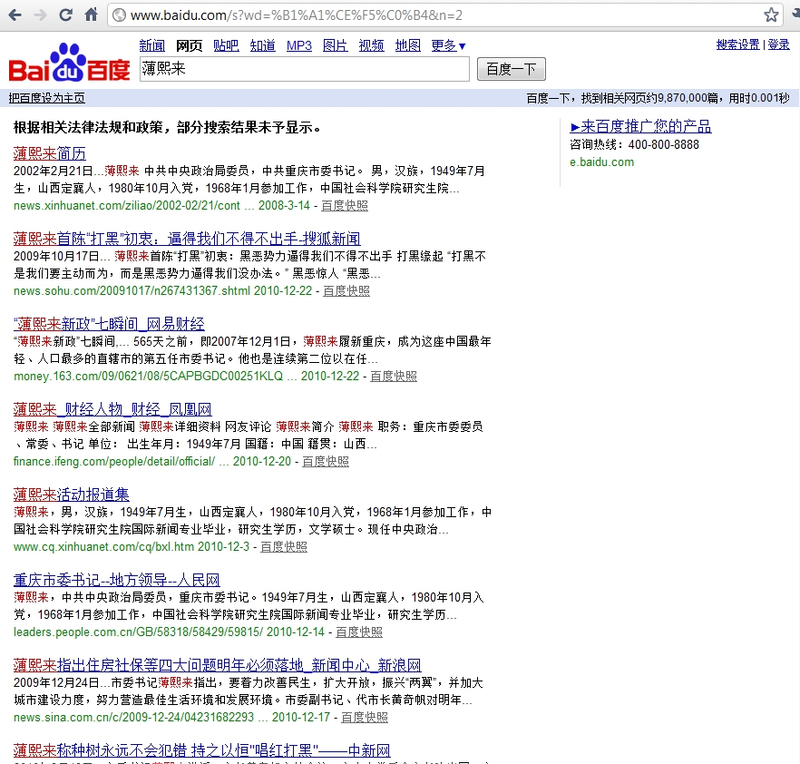 results from Baidu and Bing for "Hong Kong July 1 Grand March." Xinhua: September 25, the State Council Information Office issued a white paper titled "Diaoyu Dao, an Inherent Territory of China." Xinhua: September 28, the CPC Central Committee Political Bureau decided at a meeting to submit the proposal on the date of the 18th National Congress to the seventh plenary meeting of the 17th CPC Central Committee, which will be held on Nov. 1. 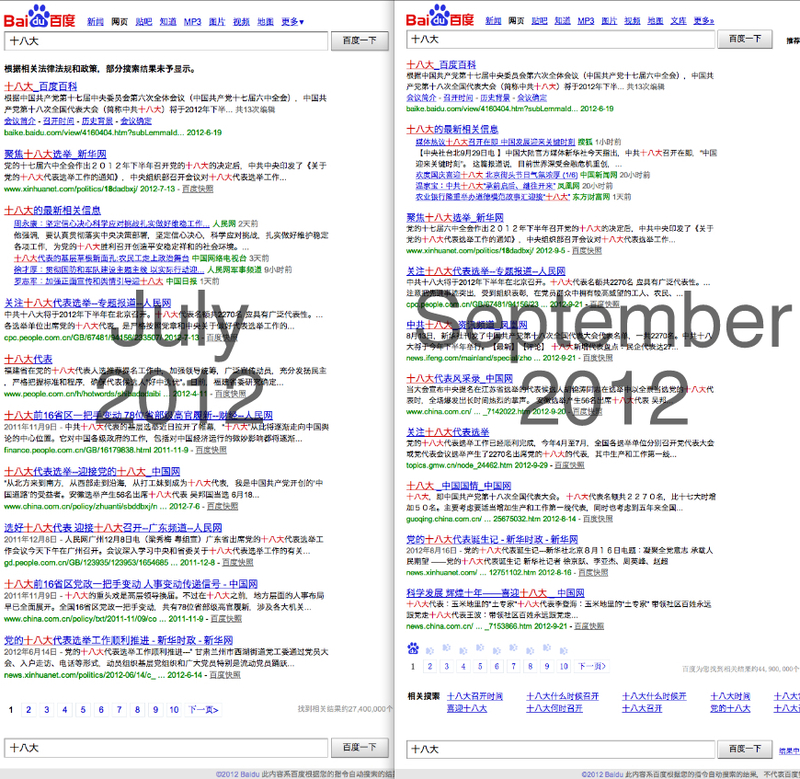 It was proposed that the 18th National Congress of the CPC would convene on Nov. 8 in Beijing. 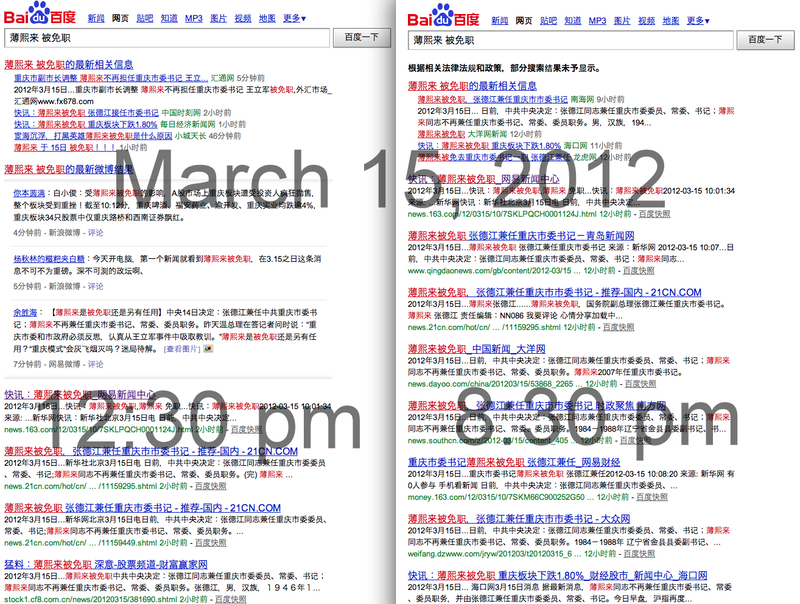 Baidu stopped censoring searches for "18th Big"
Xinhua: At the same meeting, an investigation report on Bo Xilai's severe disciplinary violations, which had been submitted by the CPC Central Commission for Discipline Inspection, was deliberated over and adopted. 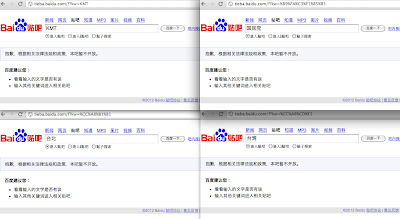 Xinhua: The Political Bureau decided to expel Bo from the CPC, remove him from public office and transfer his suspected law violations and relevant evidence to judicial organs for handling. 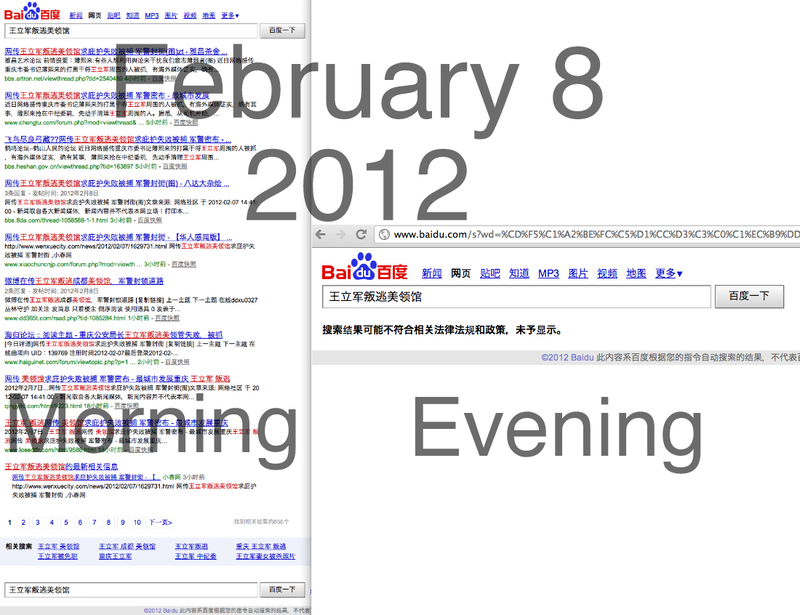 "Wang Lijun Defects to American Consulate." 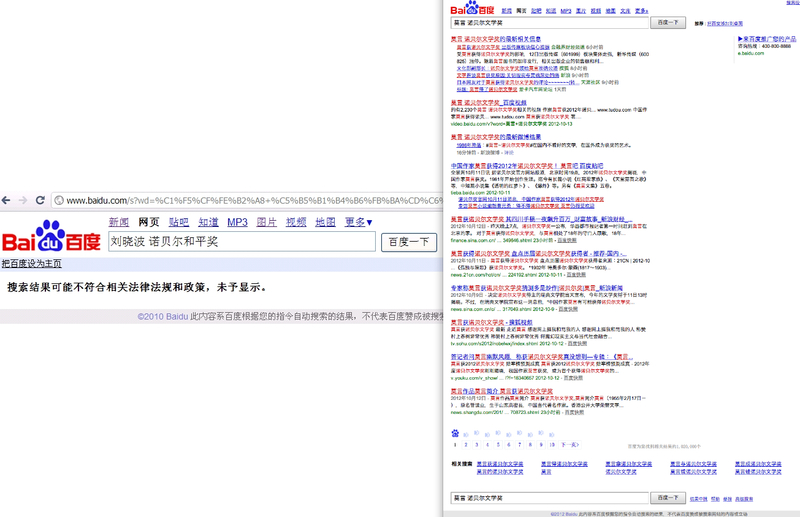 Xinhua: October 11, Chinese writer Mo Yan won the 2012 Nobel Prize in Literature. Senior Chinese leader Li Changchun sent a congratulatory letter to the China Writers Association. 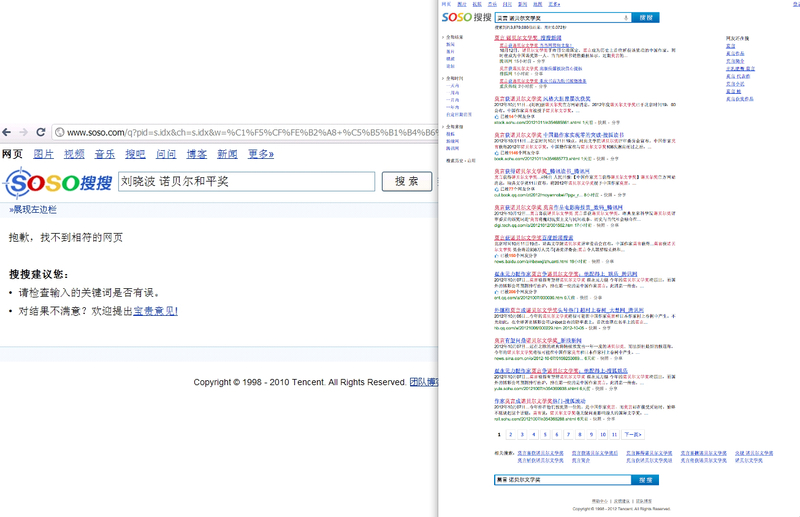 "Mo Yan Nobel Literature Prize" in 2012.